The days shortly before the end of the war. Orders have been issued by Kaltenbrunner for the bombing and liquidation of the concentration camps of Dachau, Mühldorf and Landsberg by the German Luftwaffe, an operation given the codename "Wolke A1". Gaustabsamtsleiter (District Administrator) Bertus Gerdes however, stalls the implementation of these deadly plans, arguing that a shortage of bombs and fuel make them impossible. A new plan, “Aktion Wolkenbrand“, is hatched - to poison all Jewish prisoners. However Gerdes, through stalling and delaying tactics is able to stave off the implementation of this plan, thereby saving the lives of thousands of Jewish concentration camp prisoners. Tuesday, April 17th 1945. All over Germany, people are being exhorted to hold out, and Landsberg is no exception. The mood is apocalyptic. Everyone knows that the war is now lost, no one knows what will happen next. Wilhelm Nieberle, the Ortsgruppenleiter (local group leader of the NSDAP), continues to give grand speeches, trying to prepare the population for the coming “hour of greatest trial“. Everywhere fear abounds. Fear of what the future holds, fear also of what consequences and retribution lie in store: for all have seen them, these “ragged and starving figures“. The Gaustabsamtsleiter (District Administrator) of Upper Bavaria, Bertus Gerdes, had been given the task of turning the city of Munich into a fortress. He was to assassinate American troops after marching into the city by booby trapping the ruins and piles of rubble with large quantities of explosives, to be detonated by members of the Volkssturm – code named “Operation Himmelfahrt”. In the meanwhile, “passenger vehicles belonging to fleeing prominent party and government figures filled with petrol and black market goods“, formed a virtual procession through the city, heading off in the direction of the Alps. At this time Gaustabsamtsleiter Gerdes received orders to make himself available to attend an important communication meeting in Munich. On the same evening, his superior, Gauleiter (district leader) Paul Giesler, informed him that he had received instructions from SS-Obergruppenführer Ernst Kaltenbrunner, that “by order of the Führer, a plan should immediately be drawn up for the liquidation of the concentration camps of Dachau, Landsberg und Mühldorf“. Kaltenbrunner gave the command that the Jewish concentration camp commandos of Kaufering/Landsberg and Mühldorf should be annihilated by the German Luftwaffe. The plan was given to code name “Wolke A1“. Gerdes´ superior entrusted him with the preparation and implementation of the plan. As early as the next day he met the Luftwaffe General, Galland, for an intimate lunch at the "Seehaus am Kleinhesseloher See" in the English Garden in Munich. However there, according to Gerdes, only “general questions were discussed”. A second meeting was planned to discuss the implementation of “Wolke A1“, but this was never realised. However Bertus Gerdes was still unable and unwilling to bear the responsibility alone for carrying out an order with such far reaching consequences. He presented himself at 28 Ludwigstrasse in Munich, seeking an interview with his superior. Gauleiter Giesler informed him that he alone had to come to terms with the implementation of the “Wolke A1“ plan and “reconcile it with his own conscience“. Kaltenbrunner now commanded that the Jewish inmates from the Landsberg camps were to be poisoned on their arrival at the Dachau concentration camp. Further, it was planned to liquidate all Dachau prisoners “with the exception of Aryan prisoners of the Western Forces” by means of poisoning. Kaltenbrunners new plan was given the code name “Aktion Wolkenbrand". In the meantime, Gauleiter Giesler held a private meeting with Gaugesundheitsführer (district health administrator), Dr. Harrfeld. In Bertus Gerdes´ presence, Dr. Harrfeld promised to “provide the required quantities of poisons“ in order to carry out Kaltenbrunners command. Scarcely had the first Jewish prisoners from the Landsberg and Kaufering concentration camp commandos reached Dachau, than a “courier from Kaltenbrunner arrived delivering the order to trigger Aktion Wolkenbrand". It seemed as though the fate of the prisoners was sealed. However, Gerdes went to his superior Giesler, arguing that the “front was too close to still now be carrying out the poisonings”, asking him to inform Kaltenbrunner of this. “Aktion Wolkenbrand" was thus not carried out, consequently sparing the lives of thousands of Jewish prisoners. In the meantime, events at the Gauleitung were occurring in quick succession. From all over the Reich, leaders of the SS were “imploringly seeking safe bolt holes for themselves and their families or dependents“. A Sturmbannführer of the Dachau guard detail went so far as to “get down on his knees to beg the Gauleiter for sanctuary for the families of the Dachau concentration camp guards“. He feared that the liberation of the Dachau camp by American troops would lead to “harsh reprisals against the families of the SS resident there, by the inmates of the concentration camp“. Gauleiter Giesler sent the petitioners to the Hotel Gemsbock in Berchtesgaden, where members of the SS were supposed to be able to go underground, taking on false identities, posing as “unknown refugees“. “Gauleiter Giesler told me confidentially that Kaltenbrunner´s department had been thrown into a positive uproar when I failed to trigger operation “Wolkenbrand“, and that I should take seriously the fact that the Gestapo were now out to get me“. Gerdes feared for his life, and for those of his family members, who at this moment were hiding, under false names, staying with a farmer in Weilheim. When, at the instigation of General Hübner, the head of the “flying court martial“, Giesler gave his Gaustabsamtsleiter the order to “liquidate, by means of public hanging in the town square”, the leaders of the resistance movement in Wasserburg, Gerdes took this opportunity to flee. He left Munich, never to return. Kaltenbrunner issued new instructions. The Commander of Dachau concentration camp received orders to “transport all prisoners from Western European nations to Switzerland by lorry.” The remaining prisoners were to proceed by foot to the Oeztal region “where their final liquidation will be carried out anyway“. The sufferings of the Kaufering and Landsberg prisoners was not yet at an end. They were now driven, without mercy, by their guards southwards. Whoever was too weak or too sick to continue walking was simply shot or beaten to death and left on the side of the road. During these last days of the war, long columns of ragged and starving people formed processions of misery through towns and villages of Upper Bavaria. The murder continued to the last. American troops, suspecting what fate awaited the prisoners, hurried to move the front forward, in order to overtake the seemingly endless columns of marching prisoners. It was a battle against time. 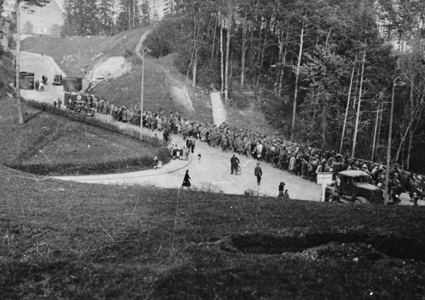 At last, on 2 May 1945, the last prisoners were liberated by US troops at the Tegernsee. Bertus Gerdes managed to escape the Gestapo and the SS. In the vicinity of Königsdorf, he “dismissed his driver, as well as his car“, changed into civilian clothing, got hold of a ladies bicycle from the school in Seeburg, and using the assumed name “Johann Seidel“, went into hiding in the municipality of Dingolfing, pretending to be, instead of a Gaustabsamtsleiter, an estate manager, apparently displaced from Mecklenburg-Western Pomerania. On November 20th 1945, Bertus Gerdes was questioned by the C.I.C. in Nuremberg. In his statement, he was scathing in his accusations of Kaltenbrunner. Ernst Kaltenbrunner, who had occupied the position of head of the security services of the Reichsführer SS since 1943 was sentenced to death by the international military court at Nuremberg. Only many years later, in March 1989, did the former inmates of the Kaufering/Landsberg concentration camps learn the truth of what actually happened in those dark days. The document PS-3462 from the archive files of the Nuremberg trials, revealed the name of the man to whom they owed their lives. They searched for him, in order to thank him, and honour him for his selfless act. Together they attempted, after 44 years, to track down Bertus Gerdes, but their attempts were in vain. All efforts to trace Gerdes remained fruitless. No one knew the whereabouts of the man who had saved the lives of thousands of concentration camp prisoners. In 1993, the first version of this article appeared in “Themenhefte Landsberger Zeitgeschichte”, ending with this sentence: “Bertus Gerdes would today be 81 years old. Maybe he is still alive?“ However, no reaction was forthcoming. Bertus Gerdes remained untraceable. In March 2005, a second version of this article was posted on the internet. Three weeks later, I received an email from the children of Bertus Gerdes. They had stumbled on the article by chance whilst doing internet research, and they found out for the first time that their father was responsible for saving the lives of thousands of concentration camp prisoners. He had never mentioned to them his experiences in the closing days of the war. 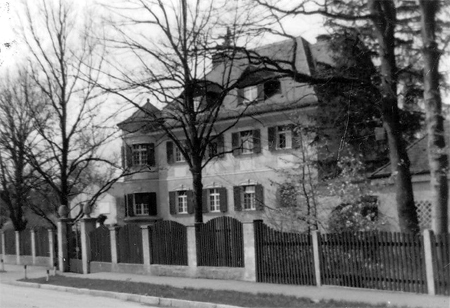 During the final years of the war – as the bombardment of Munich increased, Bertus Gerdes had lived in a large villa, together with his family, in Gauting, belonging to Hans Ritter von Lex. Gerdes himself, was very seldom at home, and spent most of his time at his place of work, in Munich. 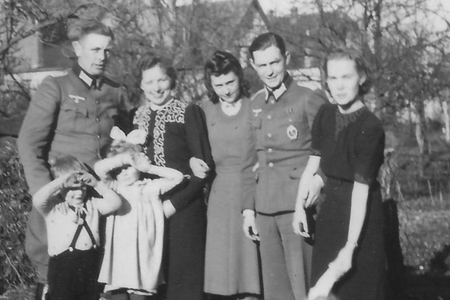 In the turmoil of the last days before the war ended, Gerdes had no contact with his family. His wife Renate and their four children had no idea that he was living under the assumed name of "Johann Seidel", posing as an estate manager near Dingolfing. His wife was questioned almost daily by U.S. Officers, keen to know the whereabouts of her husband, the Gaustabsamtsleiter, who was now officially a wanted man. Her children went hungry, and were often chased away when attempting to forage from the local farmers, despised now as Nazi children. All alone, the mother decided that she, together with her children, would try to find a way to return to her parents in Northern Germany. 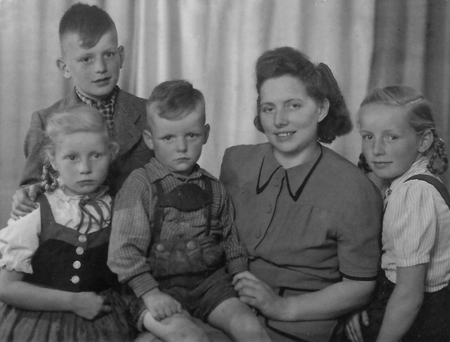 When she heard in December 1945, that a convoy of prisoners was being assembled, heading for Hamburg, which refugees could also join, she grabbed the opportunity, and left Bavaria with her children. Meanwhile, Bertus Gerdes was arrested in December 1945 by the C.I.C. interrogated in Nuremberg and interned in the Neuengamme camp until June 1948. In 1962 Gerdes divorced his wife – the family was split up. Bertus Gerdes died in 1965.